DHD have redesigned the latest issue of the PSMG magazine using new digital software. 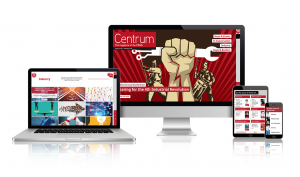 The new PSMG magazine ‘Centrum’ is produced using a pioneering platform that enables readers to interact with it on any device. Here, the editor David Leck gives us an insight on the new format and topics covered in this edition. As the PSMG looks towards innovation and technology as being central themes of our work in the months to come, it’s fitting our magazine should also move with the times. So, welcome to the first issue of Centrum. You’ll notice immediate changes in layout and design and in articles being grouped within themed sections, but what you’ll also see are a number of features contained within what is an exciting new platform that takes digital publishing to a whole new level. The days of cumbersome, unresponsive static online versions of printed magazines – often incompatible across the various platforms we all now use – are gone. The technology our partners at DH Design (dh-design.co.uk) have utilised to create this new fully-interactive magazine is also being used by the likes of PwC, EY, Volvo and Nestle, so the PSMG magazine is in pretty illustrious company. Centrum is intuitive in the way it can be viewed, easy to navigate and encompasses a number of functions designed to enhance the reading experience. It comes with added features such as video content and, unlike older versions of e-publications, Centrumwill resize and adjust itself smoothly to the devices on which it’s being viewed. If you’ve been one of our kind contributors to this launch issue you can share your article by clicking on the relevant social media icon beneath your by-line. And on the subject of content, we’d like to thank all those who’ve helped make this first issue possible by writing articles on everything from the gender pay gap and plagiarism to a new benchmarking skills programme and great tips of how we can all develop our learning skills. We also consider how best to disrupt the disrupters, and we’re delighted to have Michelle Elstein of Morrison & Foerster front our revamped In Conversation feature. Producing any new publication is a challenge and we know we won’t have got everything right. We’ve barely scratched the surface of the potential offered by this new software so, if you’ve any thoughts or suggestions, we’d love to hear from you. And do remember we are always interested in ideas from members with a subject, passion, viewpoint or ‘soapbox’ stance on which they’d like to write. Our next deadline is December 14. The marketing and business development functions within professional services must remain central to commercial success as we face challenges from not just technology and innovation, but economic and geo-political influences, as well as cementing our own positions at the heart of the firms we represent. We hope Centrum can play a role in helping ensure our members take that centre-stage role within the businesses in which they operate – and we hope you enjoy this first issue.